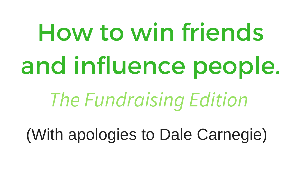 Dale Carnegie's seminal book, How To Win Friends and Influence People, was published 80 years ago. It's an oldie…and it's still a goodie. And it wasn't written for fundraisers. However, there are many lessons you can apply when you want to raise more money for your nonprofit. Let's consider each of his 6 principles in the section, "How To Get People To Like You." Carnegie's principle #1: Become genuinely interested in other people. Fundraising corollary: Relationships first. Money second. Far too many people think fundraising is all about "asking." Really, it's about helping people connect to causes they already care about. Successful fundraisers understand the value of relationships. If you want to develop real relationships, the first thing you need to do is get to know what's important to your donor. After you help your donors understand how their interests align with your work, then you'll be ready to ask. Fundraising corollary: Have an attitude of gratitude. Whether you're talking to a donor in person, online, or on paper, give your donors a reason to smile. After all, it's their donations that make your good work possible. In your thank you letters, newsletters, and impact reports, look for ways to surprise and delight your donors. Always convey your gratitude as well as hope and optimism for what will change because of their support. Carnegie's principle #3: Remember that a person's name is, to that person, the sweetest and most important sound in any language. There are plenty of studies that show that a personal letter addressed "Dear Susan" will yield better results than the same form letter addressed to "Dear Friend" or "Dear Supporter." Make sure you know your donor's correct name. Even more importantly, know how THEY want to be addressed. Don't call her Deb when she prefers Deborah. And definitely don't call him Thomas or Mr. Ahern; he's Tom. And, if you want to be sure that all of your nonprofit's communications are truly donor-centric, take Tom Ahern's "You" test. Carnegie's principle #4: Be a good listener. Encourage others to talk about themselves. Fundraising corollary: Understand what's important to your donor. When Carnegie talked about listening, he was talking about becoming a good conversationalist. In fundraising, active listening is an important skill. You want to listen to understand and not just to respond. In fact, in major gift fundraising, there's a technique called "conversational fundraising." It's the process of getting to know your donor and asking questions about what's important to them, what shapes their attitude towards giving, and how they'd like to support your work. Carnegie's principle #5: Talk in terms of the other person's interest. Fundraising corollary: One size doesn't fit all in fundraising. Segmenting your donors is a valuable strategy when communicating with your donors  whether through targeted appeals, newsletters, or events. Don't just segment by giving history, though. Consider each donor's interest areas as well. Take a nonprofit that protects open spaces and builds community trails. They might segment their donors by land owners and land users (e.g. bikers, hikers). This organization might change its messages slightly for each audience. Perhaps they'd plan a fancy gala for one segment and more laid back affair for the other. It's possible they might even ask these two segments to support the organization at different financial levels. Carnegie's principle #6: Make the other person feel important  and do it sincerely. Fundraising corollary: Make the donor the "hero" of your story. In nonprofit communications, you always want to make the donor the "hero" of your story. Have you heard this saying? "People give to people. They don't give to organizations." How about this? "Donors don't give to your organization. They give through your organization." People give to people they know…and like…and trust. They also give to causes that matter to them. Most importantly, your donors will continue to give when they feel appreciated and believe their contribution  no matter how large or small  is making a difference.